Arrive home and have to negotiate a goat track to reach the house? Every time it rains your driveway becomes a quagmire? Instead of the water running off your driveway and into the drains it just runs straight down the middle of the road and the ruts are getting bigger? You’ve bought your dream block’ decided on the house site and now need a driveway so the work can get started? Been patching your driveway for years a bit of gravel here and there’ few hours for a bobcat to spread it around – only to see it all wash away with the next big storm. My name is Jason Reker and I live in the Gympie region. After many years working in the earthmoving industry I decided to start Gympie Grader Hire in 2006 and have modeled the business on quality service and work ethic that I value so high. If you feel I can help you please give me a call on 0438216745 or send me an email. 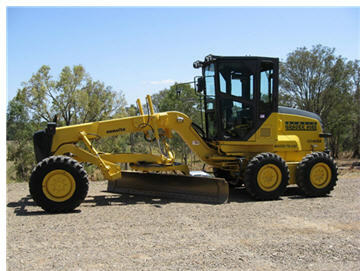 A grader is designed to form the sub grade cut V drains and run offs. Work the gravel to achieve sufficient cambers to get the water off as quick as possible and reduce wear. Water cart works alongsside the grader to keep the gravel at the optimum moisture content. Vibrating roller compacts the moist gravel leaving a smooth attractive driveway designed and constructed to last. An excavator to professionally install pipes head walls getting to those tight areas shaping banks landscaping detailed earth works and trenching. Thank you for your time and you business is important to me. You can contact me Jason Reker on 0438 716 439 to book in a free quote or send me an email all enquiries welcome. Ian & Judith Leslight’ The Dawn.